The Horseman VCC PRO View Camera Converter enables a full range of camera movements to be utilized when photographing with a Nikon F-mount DSLR camera, allowing you to control perspective distortions and achieve unique depth of field effects. 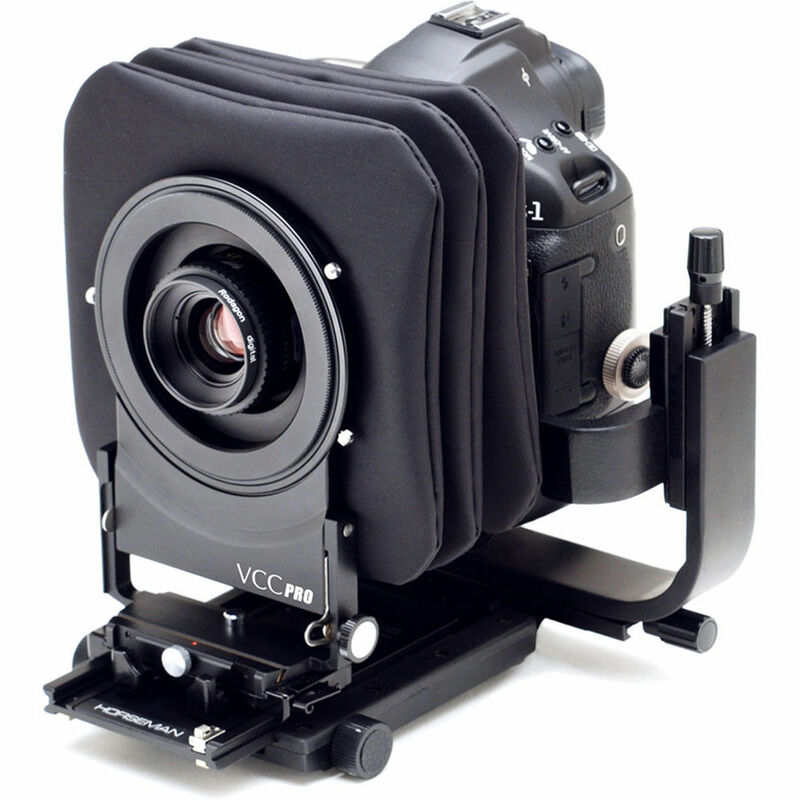 As the central component within a modular system, the VCC PRO includes the dedicated camera adapter as well as an M39 lens panel, and also supports the use of a wide array of large and medium format lenses via additional lens panels. The VCC PRO's relatively compact, lightweight form factor and ability to accept a wide variety of lenses makes it ideally suited to use on location, as well as in the studio. Once the Nikon F-mount DSLR camera is attached to the VCC PRO body, it can be switched between horizontal and vertical shooting orientations by simply turning a knob, rather than re-orienting the entire camera. The rear standard also incorporates a spindle drive that permits 30mm of vertical movement and 40mm of lateral movement for seamless stitching of multiple frames, with the ability to lock the camera in place for greater precision. The use of a bellows for focusing also better enables making close-up imagery without the need of extension tubes or an additional bellows. For precise perspective and focusing control, both front and rear standard movements can be used. An integrated spindle drive on the rear standard permits seamless stitching of multiple frames in order to accomplish panoramic-type imagery. This rear drive allows fluid movement of the mounted back with secure locking at each position for greater accuracy. This view camera converter is the central component within the VCC system, and allows you to pair a Nikon F-mount DSLR camera along with large or medium format lenses. Box Dimensions (LxWxH) 9.5 x 7.9 x 6.6"
VCC PRO View Camera Converter for Nikon is rated 2.0 out of 5 by 2. Rated 2 out of 5 by Photos from Good but major design fault. I have just purchased this new Horseman VCC unit to replace the older version. One major fault with the new Horseman VCC adaptor which I only realized after receiving it is when the camera is in a vertical position you can not attach a flash transmitter to the cameras hot shoe. Also you cannot attach a flash PC cord and a Nikon electronic cable release due to the design of the metal arm, which holds the mount. The only way to fix the problem is to attach a Nikon PK-11a extension tube to the mount, which then can give enough space to attach a flash PC cord and Nikon electronic cable release. If I had known about the major design fault I would not have purchased the new version. Also the rear shift mechanism is very stiff to the point of removing skin. I have send emails to Horseman USA and the Kenco the Japanese's owner and have not received a reply. So if I had not invested money into the new system I would gladly have keeped the Horseman I all ready owned. Rated 2 out of 5 by Simon Harper from Good but major design fault. Hello,I have just purchased the new Horseman VCC unit to replace the one I am selling. The reason I am selling the old unit is because I have sold all of my medium format equipment. One major fault with the new Horseman VCC adaptor which I only realized after receiving it is when the camera is in a vertical position you can not attach a flash transmitter to the cameras hot shoe. Also you cannot attach a flash PC cord and a Nikon electronic cable release due to the the design of the metal arm which holds the mount. The only way to fix the problem is to attach a Nikon PK-11a extension tube to the mount which then can give enough space to attach a flash PC cord and Nikon electronic cable release. If I had known about the major design fault I would not have purchased the new version. Also the rear shift mechanism is very stiff to the point of removing skin. I have send emails to Horseman USA and the Kenco the Japanese's owner and have not received a reply.So if I had not invested money into the new system I would gladly have keeped the Horseman I am selling as I believe it to be more user friendly. I have a set of view camera lenses which I use with my Toho 4 X 5 vew camera. How do I use these lenses with this VCC Pro? You would just need to attach a Nikon DSLR to this device and use the lenses as you would on a traditional view camera. why can i not take my Horseman 4x5 view camera and use the vcc camera mount and use it like the one your trying to sell here? The Horseman VCC PRO View Camera Converter will not connect to a Horseman 4x5 view camera. It is specifically designed for use with DSLR cameras, and not for use with the 4x5 camera. Can you please mention all items needed to build the complete system for Nikon SLR body?The picture does not show that, neither the description does. I hate guesswork. The Horseman VCC PRO View Camera Converter for Nikon comes with everything you need to connect the camera converter to a Nikon DSLR camera body. As indicated under the In The Box section on our website, the following items are included with the Horseman VCC PRO View Camera Converter for Nikon:In the BoxHorseman VCC PRO View Camera Converter for NikonVCC PRO DSLR Adapter for NikonVCC PRO Lens Panel for M39 LensesLimited 1-Year WarrantyThe only other item you would need would be the lens adapter to connect the type lens you own onto the VCC PRO View Camer Converter. Unfortunately, you do not list the brand/model medium format or large format lens you own, so you would have to e-mail prophoto@bhphotovideo.com with the brand/type of your lens so we could recommend the correct lens adapter for your needs. You may also view the Accessories tab on the page to view the lens adapters available for use with the above system. What lenses can be used with the VCC Pro?